Today started out perfect - as we both had a great nights sleep in our comfortable room! We were both very glad that our first night was not in the camper, and in the comfort of a real bed so we could get our barring on the time zone. We woke to a gorgeous sunrise over Welligton Bay. And how! Tyler managed to spot a great skatepark right out our hotel window. So the early morning started with getting our bodies moving - T in the bowl and me on the jump rope. By 7:45 we were showered, packed up and checked out to get on our way to the Interislander Ferry. Three and a half hours later, we arrived to the South Island by way of the lovely port town Picton. From there, it was a windy and twisty drive in the campa to the town of Nelson. We didn't arrive there until a bit past three, so sadly had to miss out on the brewery biking tours we had been aiming for. The good news? After checking into our campsite (first night in the campa), we found a spot on the beach. Yup, that's correct, right on the beach. Quite a view! After some sandwhich making, we headed straight down to the water for a proper swim. The weather is incredibly hot here, and the water was like almost as warm as a bath. Lovely! We then got our campa all configured for the evening. Bed pulled out, bags in the front seats, pillows in their places... Is it time for some beer and wine yet? We thought so! We walked for about 30 minutes before encountering the Montileeth Brewing Company (Nelson has the most breweries in NZ) for dinner. NZ blue fish and salmon for me, rack of lamb for T. We were properly tired after another long day, so slept (more or less) soundly in our Jucy. Off to Abel Tasman in the morning for a day of swimming! Our campsite for the night. $22NZD / person. Not bad eh? It's official. Day One was a success. 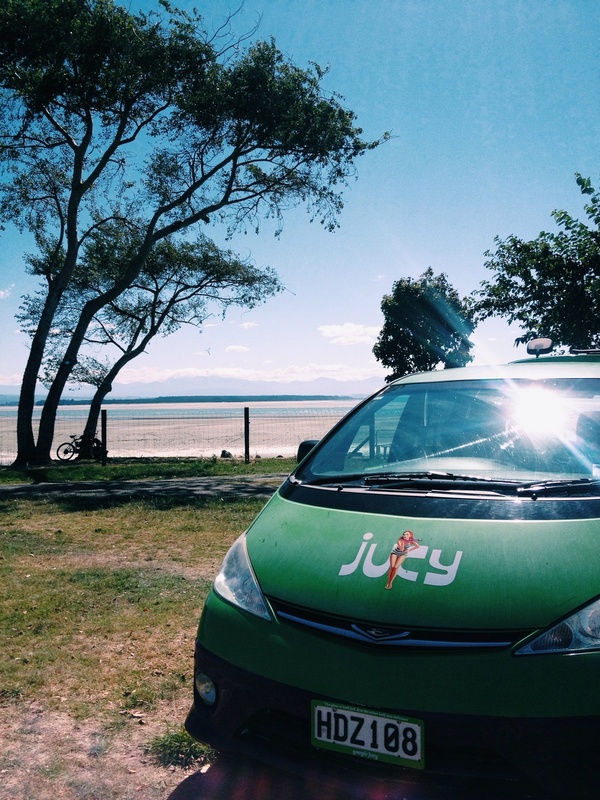 After landing at the wellington airport, we headed up a hill to pick up our trusty steed for the trip - our Jucy camper. (Or campa in Kiwi). Neon green and purple, it's hard to miss. However, as we get the hang of driving on the left side of the road, we're kind of greatful that the campa screams "we're not from around here - take haste!" Since it was our first night, and we were in a bigger city, we booked a room at the Museum Art Hotel. Right on the water, we were able to use the swimming pool, gym and shower. We felt almost human again by noon - showered and ready to explore after almost 20 hours of travel. We found a great bar and sat down to watch the Super Bowl. A "jug" of beer (or two) for Tyler and some sauv blanc for me, and we were officially on our way to a proper honeymoon! Burgers and potato popcorn filled our bellies. At halftime, we needed to stretch our legs. Up, up, up (fueled by flat whites) to the Mount Victoria Lookout. What a view! Back to our new favorite bar to watch the broncos steal the show! High on winning, we heded to the Te Papa Museum for some NZ culture. Pretty exhausted at at this point, we headed back to the hotel, where we were welcomed by a bottle of champagne. A two hour nap - followed by a 10pm light dinner at the Matterhorn. And man, did we sleep well! A perfect start to our trip. Off to the South Island via the Interislander Ferry in the morning. Wine, kayaks, mountains and exploring await! After an uneventful and overall comfortable flight, we've landed in Auckland! Our connecting flight to Wellington wasn't until 10:05am, and seeing as we landed at 5:20am, we sought out flying standby. Were now on a 7:30am flight and on our way!